Whistler Village is easily accessible by speedy shuttle or scenic stroll. Shopaholics, rejoice. Cascade Lodge has the largest outdoor pool in town. Enjoy a soak in the hot tub while kiddos play sharks 'n minnows. When nobody quite feels like going out, a roomy suite with cozy living area makes a prime space for kicking it with your crew. No need to interrupt your exercise regimen thanks to an onsite fitness facility. Unwind with a post-workout stop by the sauna. 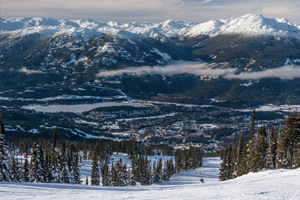 It's a 5 minute drive to Whistler Ski Resort, Whistler Village Gondola and Fitzmmons Express Lift. Get ready to hit the slopes. The resort is located right in the heart of downtown Whistler. Recover from your day with a soak in 1 of the resort's 2 hot tubs. Get your snacks ready. Blackcomb Trail is just a 5 minute drive from the resort. Brush up on your game at Whistler Golf Club-Driving Range, an 8 minute walk from the resort. Whistler Cascade Lodge in Whistler Village North is just a ten-minute walk to to the lifts at Whistler Blackcomb Ski Resort, the #1 Ski Destination in North America - 3 years running! Make the most of your mountain getaway with lodgings just as prime as the powder. If you had to describe Cascade Lodge in one word, you’d be hard-pressed to choose. (It would be something along the lines of amazing, incredible, awesome). On your first day hitting the slopes your crew can take a leisurely stroll through the quaint European-style ski village to get to the gondolas (and perhaps make a quick breakfast stop at Ingrid’s Cafe), or hop the Whistler shuttle to get straight to slopes. With 40 lifts, two mountains, and over 8,000 acres to explore, Whistler Blackcomb delights first-time riders and seasoned shredders alike. After an adventure-filled day on the snow return to Cascade Lodge and drop your skis and gear off at the resort’s complimentary ski storage. After a brief stop at your condo to get changed into swimsuits and grab towels, brave the cold on the way to the largest heated outdoor pool in Whistler. Or, soothe your sore muscles in one of the hot tubs while you admire the spectacular views of Whistler and Blackcomb Mountains. Follow up with a visit to the sauna for ultimate relaxation. The décor in each bright, inviting suite is simple but cheery. Studios feature handy kitchenettes with a mini-fridge, stove and microwave. (Remember, there’s no shame in Pop Tarts for breakfast - you’re on vacation). Need more space? One- and two-bedroom condos feature full kitchens with everything you need to cook everyone’s favorites (like your famous chocolate-chip cookies). Feel like a low-key night in? All condos have flat screen TVs with DVD players – perfect for movie night. Choose from the resort’s movie selection (you get one complimentary DVD rental per day) or bring your favorites from home. In-unit washer/dryer makes sure you always have fresh Under Armour to ski in. The pedestrian-only Whistler Village offers an array of fine dining, shopping and nightlife. Alta Bistro features an award-winning wine list and organic food. Sachs Sushi was named Whistler’s Best Sushi Spot by Lonely Planet. Or surprise the kids by letting them build their pie at Fat Tony’s Pizza. Souvenir shopping? Hatley sells fun gifts and apparel like onesies and “ugly sweaters.” Amos and Andes Sweater Shop has been a favorite among the locals for more than 20 years. For date night check out Hy’s Steakhouse and Cocktail Bar, serving steak, seafood and wine. Save room for desserts like Key Lime Pie or Hy’s Famous Cheesecake. For a grownups-only night out, simply bar-hop your way across the lively aprés scene. - The minimum check-in age for this property is 21 from May 1 - November 17, 2016. The name on the card used for incidentals must match the name on the card used for the reservation. The check-in age is 25 over Victoria Day weekend (May 20-23, 2016). For more details, please contact the office using the information on the reservation confirmation received after booking. Secluded from the activity and night life of Whistler Village but within walking distance of Blackcomb and Whistler Gondolas. At the center of Village North is the Whistler Marketplace, featuring a supermarket, pharmacy and a Starbucks. Home of Whistler Olympic Plaza, an outdoor performance venue.